Does anyone like to read stories which evoke an atmosphere of Leeds in bye-gone days? You might like to try, if you haven’t already, the Richard Nottingham novels by Chris Nickson. With 5 in the series, there’s plenty to go at! Chris says: ‘Nottingham is the Constable of the city, and his deputy is John Sedgwick. The books are about more than murder. They’re about the people of Leeds and the way life was – which mean full of grinding poverty for all but the wealthy. They’re also about families, Nottingham and his and Sedgwick, and the way relationships grow and change, as well as the politics, when there was one law for the rich, and another, much more brutal, for everyone else’. 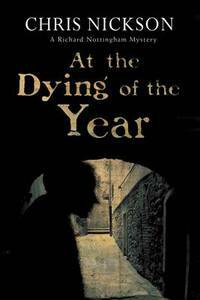 The latest book, which will be in libraries very soon, is called ‘At the dying of the year’ and is set in Leeds, 1733. Three children are found dead in a disused bell pit; their bodies battered and bruised, each of them stabbed through the heart. As an atmosphere of fear and suspicion pervades the city, Richard Nottingham and his team find themselves hunting a ruthless child-killer, a monster who preys on abandoned street children. This entry was posted in Book Reviews, Books and tagged Book Reviews, Books, writers. Bookmark the permalink.